The next time you’re driving through the streets of Dubai, take a moment to pause and absorb the vast number of oversized advertising billboards around you. Due to the high cost of renting advertising space, each poster stays up for just a short time before the campaign is over and the material is thrown away. But this waste culture is slowly becoming a thing of the past thanks to Etuix. 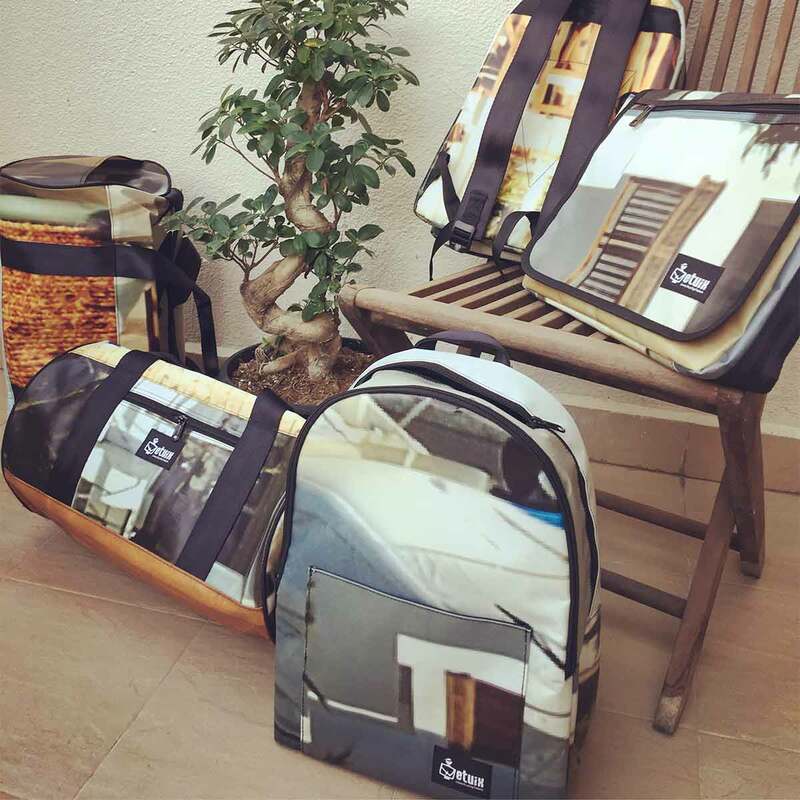 This Swiss-Italian brand transform commercial PVC poster tarps into unique, high-end bags, luggage and accessories with quality and longevity. We love how every piece is made with a creative design and timeless style to make a truly luxurious statement while also giving a new lease of life to materials destined for the scrap heap. Etuix offers the opportunity to invest in an exclusive bag or piece of luggage to cherish along with the knowledge that your purchase supports eco-sustainable projects around the globe. You will enjoy a statement piece created using a passion for fashion, design and creativity, whilst breathing new life into used materials and rescuing them from landfill. Every Etuix piece offers the perfect balance between Swiss precision and the finest Italian craftsmanship with unique textures and colours courtesy of an intricate design process. In turn, your purchase is helping to reduce the catastrophic issue of plastic pollution where 1 million square metres of PVC plastic material for advertising, construction and concerts is produced every year in Dubai alone. As the third largest thermoplastic material by volume, this is equivalent to more than 3 million kilograms of CO2 or more than 1.5m plastic bottles. The Etuix ecological concept supports recycling, reuse and the circular economy with a respect for the environment and a commitment to reduce the impact of trend-led fast fashion through the creation of timeless, eco-friendly lifestyle products. With every product already made from 100% recycled PVC, the brand also supports the use of eco-friendly ink and UV printing for the adverts themselves to minimise environmental damage. For every Etuix piece that you choose to purchase through One Good Thing, a percentage of profits are invested into non-profit organisations working on eco sustainable projects for an impact that just keeps on giving. Recent projects include the Year of Zayed billboard project to promote sustainability in partnership with both Emirates Environmental Group and Footprint Outdoor Advertising where donations are made towards three special needs school in the UAE. Born in Europe on the Swiss-Italian border and now flourishing in Dubai, Etuix is a brand with an authentic global heartbeat. It was back in 2008 that the idea started to take shape when outdoor advertising agency Lapix Sagl identified a need to dispose of their advertising maxi posters. Etuix co-founders Gianmarco Galli and Matteo Boffa decided to do so with an eco-friendly approach and the idea to create many types of objects from recycled PVC material. The first product was produced by summer 2009 and the collections quickly expanded with the first handbag in 2010 swiftly followed by iPhone cases and a range of office products. Today, the Etuix team create beautiful products from their factory in Italy and manufacturing plant in Dubai help preloved material find its way back into society with a vision to bring waste full circle. There’s never been a more important time to bag it up. A great and versatile back pack, perfect for college, going to the gym or weekends away. big enough to fit your laptop, phone and gym kit but not so big that it gets in the way. Also contains a reinforced compartment for an iPad/tablet and a smaller front pocket for stuff that might leak and useless bits of paper that you should probably just throw away. The straps are made from re-used car seat belts so are comfortable and hard-wearing. Made from genuine recycled billboard material so each one is unique. No-one else will have one the same as yours. A small pouch bag designed to carry around all your little essentials without having to worry about spillages or losing them in the bottom of your bag. Big enough to get all your important bit and pieces in. Small enough to carry around without taking up too much all-important space. A great and versatile messenger bag, perfect for college or work..or being a messenger. Plenty of room for your laptop, books and important documents. The internal compartment is reinforced so it can withstand a knock or two and has a separate zipped internal pocket. The shoulder strap is made from re-used car seat belts with a bit of extra padding so it’s comfortable and hard-wearing. Made from genuine recycled billboard material so each one is unique. No-one else will have one the same as yours. 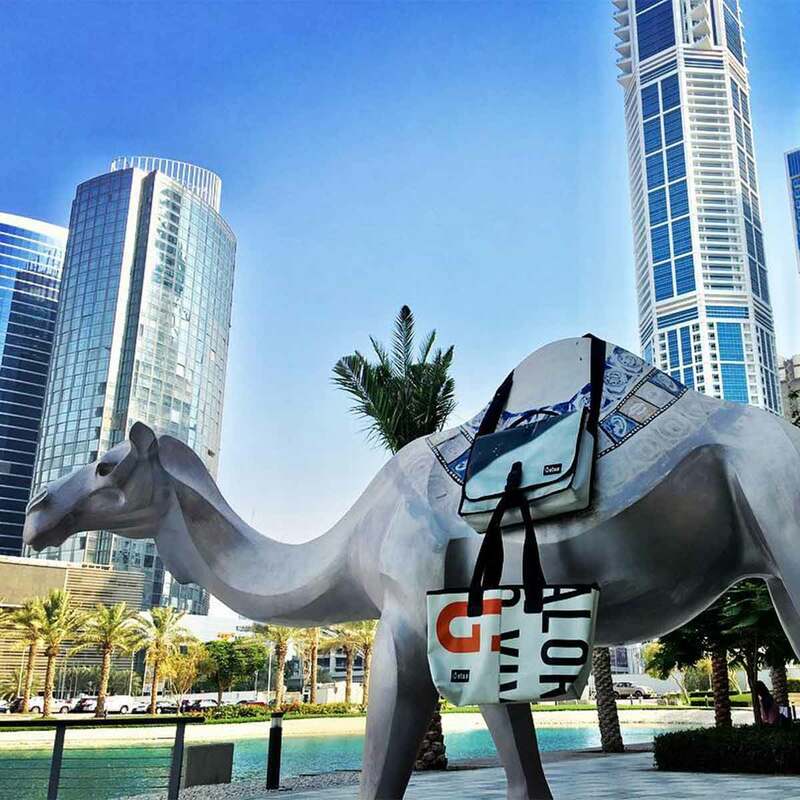 A truly unique sports bag made from recycled Dubai billboards and with handles made from car seat belts. A roomy central compartment with plenty of space for all your sports kit or whatever you need for a night or two away. Obviously it’s weather proof too (it would have to be due to its previous life as a billboard. The shoulder strap is made from re-used car seat belts with a bit of extra padding so it’s comfortable and hard-wearing. Made from genuine recycled billboard material in the UAE so each one is unique. No-one else will have one the same as yours.